In your heart a shining star. As Diamond went on singing, it grew very dark, and just as he ceased, there came a great flash of lightning, that blinded us all for a moment. 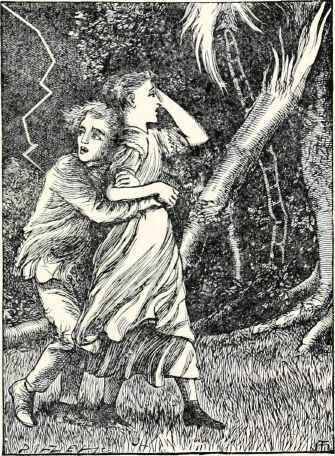 Dul­cimer crowed with pleasure; but when the roar of thunder came after it, the little bro­ther gave a loud cry of terror. Nanny and Jim came running up to us, pale with fear. Diamond's face too was paler than usual, but with delight. Some of the glory seemed to have clung to it, and remained shining.
" You're not frightened — are you, Diamond?" I said.